The Oxford Dictionary defines “elite” in noun form as “a select group that is superior in terms of quality and abilities to the rest of a group or society.” While being a member of the elite is seen somehow as a detriment in American political circles, a new book from VeloPress by British photographer Gerard Brown and author Graeme Fife shows that being part an elite is a Good Thing with respect to the world of bicycles. 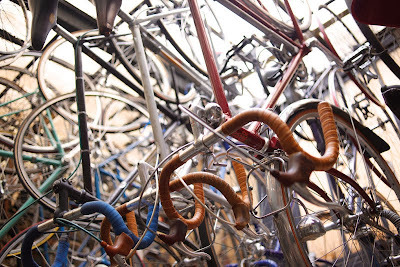 As in the case of the famous Lake Woebegon where “all the children are above average, “The Elite Bicycle” showcases a whole group of enterprises that are truly superior in quality and abilities. 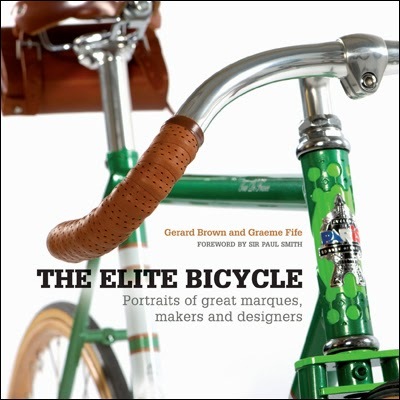 The title of the book is a bit misleading, not because the “great marques, makers and designers” are not elite but because bicycles actually do not feature much in it. But calling the book “Elite Makers of Spokes, Chainrings, Saddles, Headsets, Double Butted Tubing and Mainly Steel Framesets” would lack a solid marketing ring. There are no photos of cyclists out on some picturesque road in Tuscany or Switzerland or anywhere. In fact, in this gorgeous 224 page book with 29 chapters there are only five complete bicycles shown, along with a shot of the Alex Singer shop, crowded with finished products. 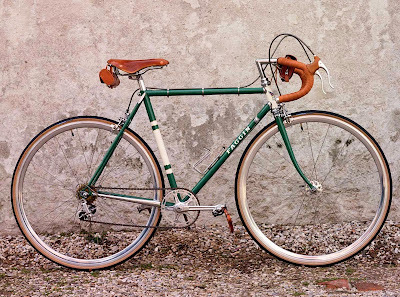 The fact that the bikes we see carry the names Dinucci, Seven, Paris, Brian Rourke and Faggin is indicative of the broad scope of the book, representing brands in the USA, Britain and Italy. This polyglot coverage includes Belgium, France, Germany and, yes, even Canada. 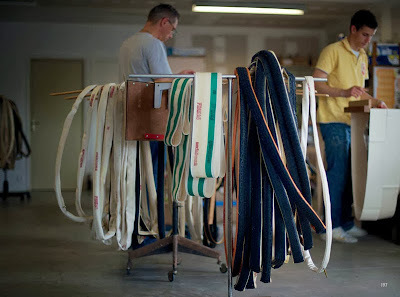 Arranged in an order not immediately apparent, the profiles begin with a pair of saddle makers who are both very old but very different. Brooks, which dates to 1882, must be the oldest producer of a bicycle component still in business. Production methods and the product itself do not seem to have changed a great deal but with the popularity of retro the circle has come around. Selle Italia, an Italian competitor established in 1897, seems very modern in comparison with its production of 9,600 saddles daily yet surprisingly those saddles are for the most part produced by small family operations offsite. 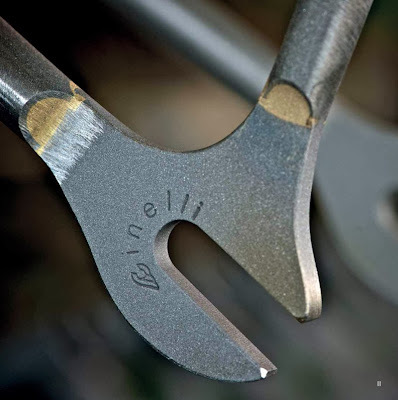 The next two profiles again match British and Italian rivals, this time in the steel tubing business. Reynolds (the Patent Butted Tube Co. until 1924, when the current name was adopted) and Columbus developed steel tubing for a variety of products, including furniture and airplanes, but are most noted today for their bicycle applications and tubing continues to be developed. 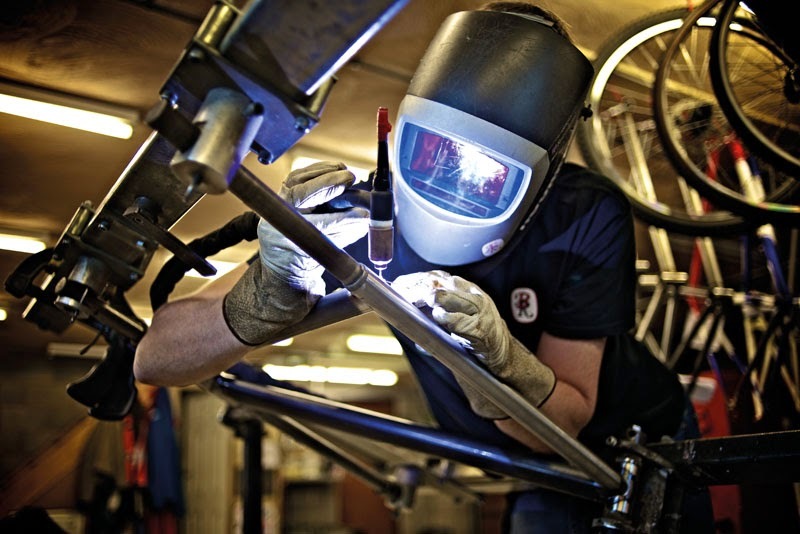 The book places the emphasis on steel here, perhaps because of its artisan qualities, but does not mention all the effort Columbus has put into carbon framesets. 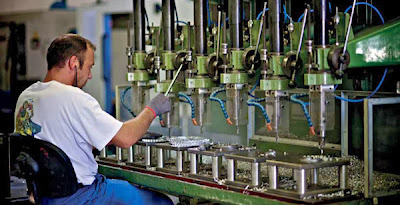 The explanation of how butted tubing is made is very interesting and is just one of many explanations author Graeme Fife offers to accompany the truly superb pictures of industrial environments and components of Gerard Brown. Mr. Fife, known for his Rapha guide books on the mountain passes of the Alps and the Pyrenees among other literary efforts, likes to explain things in his markedly eccentric style. 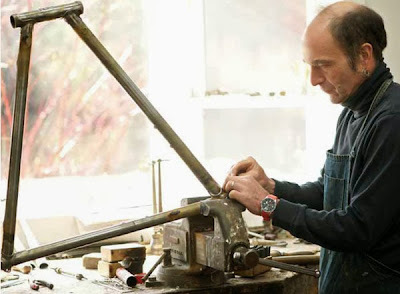 The profile on Cinelli begins with a paragraph about the Temple of Janus in Rome and spins off to a reference to Antonio Colombo's art gallery and a catalogue that lists the controversial Spinaci aerobars along with a quote from Virgil: “Here, in the inner, light-filled cave of thinking, in what many must call a sanctuary of classic Italian design and technical excellence, as elite as you can get, a poignant ache of the modern day expressed in the Latin of one of Italy's finest poets twenty-one centuries before.” And along with the origins of the words for rubber we also learn in the book that “swage” not only is a term used in metal-working but also means otter excrement. 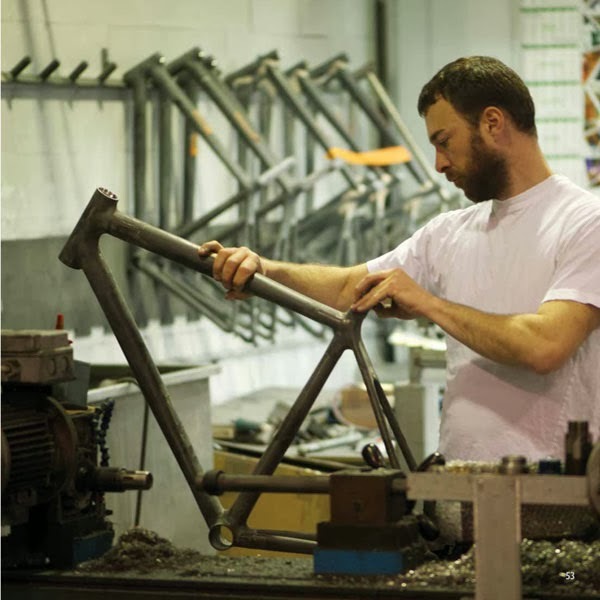 The book moves on to the familiar area of frames and even includes two noted makers of carbon frames, Guru in Canada and Cyfac in France (Time shows up right at the end of the book) but steel takes pride of place, with some titanium (first discovered in Cornwall, we learn) sprinkled in. There are excellent photos of workshops humming away, sometimes with a sole artisan, as is the case of American grand master Richard Sachs and several of his countrymen but also the larger operations of Seven, Independent Fabrication and Ben Serotta, no longer with his eponymous company. The chapter on Condor/Paris is an outlier as the company has its bikes made in Italy by contractors but the Paris track bicycle that graces the cover and is made with spectacular bilaminate lugs (no fears: an explanation of this procedure is also to be found!) excuses all. 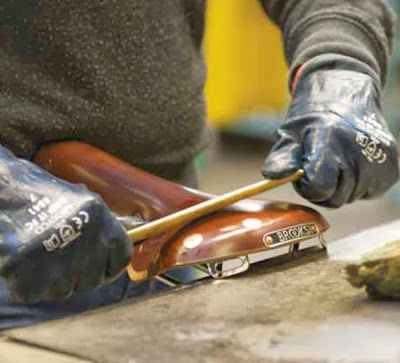 There is an impressive amount of handwork that goes into framemaking at this level and the photographs show the whole process at various points. Filing, brazing, aligning...it is a great pleasure to look at the pictures and see the whole range of operations so clearly illustrated. 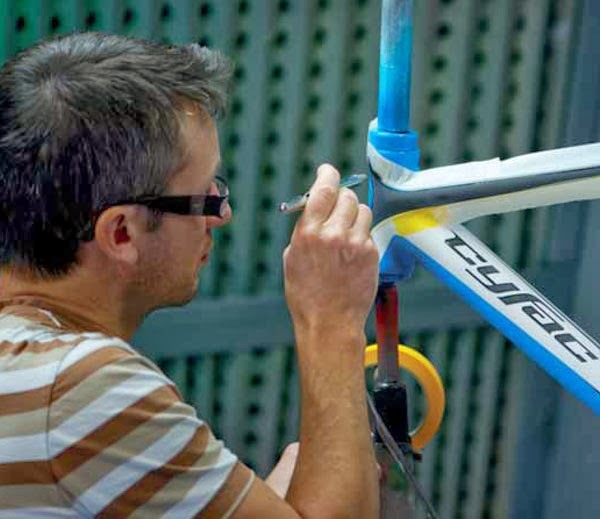 Frames are recognizable to most cyclists by name but then there are components that serve us equally well but more anonymously. 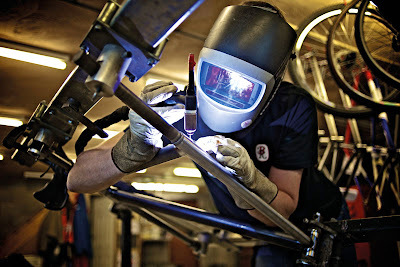 “Elite Bicycles” continues its profiles looking at chainring and crankarm manufacturing at Spécialités TA (the “TA” coming from “Traction Avant,” a failed attempt at a front-wheel drive bicycle), Antwerp-based SAPIM which produces 600,000 spokes (daily? annually?) in two factories and Chris King of headset fame. In his enthusiasm for the lovely TA chainrings, Graeme Fife makes the odd claim that Shimano chainrings are difficult to get. This might be the case in Britain, where the authors are based, but has never been my experience. The book concludes with the rubber meeting the road as we tour Mavic (which stands for Manufacture d'Articles Vélocipédiques Idoux et Chanel), maker of rims and wheelsets (although no mention is made of drivetrain components or electronic shifters which didn't work out so well), German tire giant Continental which has been making pneumatic bike tires since 1892 and French tire dwarf FMB, where pro racers have been getting their handmade tubulars since 2005 and where the workforce appears to consist of three related people with excellent sewing skills. An eccentric and entertaining book, beautifully produced with top-quality photos and amusing but informative text and a foreword by cycling-made British fashion designer Sir Paul Smith, “The Elite Bicycle” deserves to find a place on many a cyclist's bookshelf this holiday season. Even ones unfamiliar with Virgil.